Whit Kirtland at Bradford Marine Yacht Sales gets in touch to say there's been a hefty $2.5 million price drop on his central listing, Leopard's 32m motor yacht Jade Mary. Designed by Andrea Bacigalupo, Jade Mary was built to Bureau Veritas class in 2006 by Italy's Arno yard. Accommodation is for up to nine guests in a master suite, two double staterooms and a twin cabin with Pullman berth. 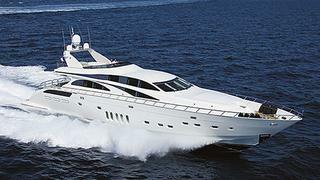 A powerful propulsion package of three 2000hp MTU engines driving triple waterjets gives a cruising speed of 34 knots. On display at this month's Miami show, Jade Mary is now down from $8 million to $5.5 million.